Frame and filled doors are one up from the humble batten door. They are outstanding in their ability to last in hard weather conditions. 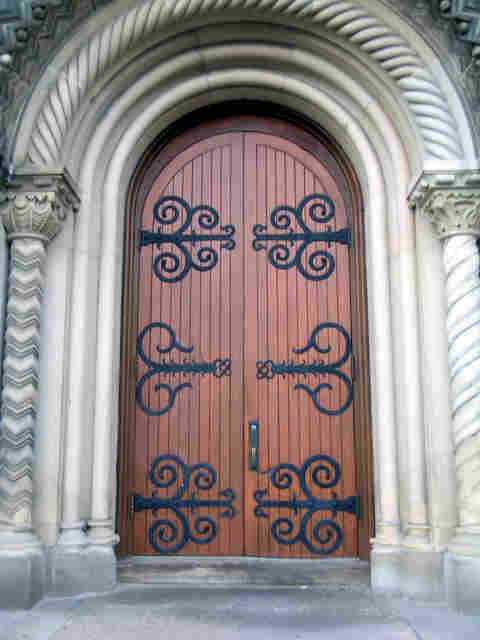 A well made and maintained external door of this type could easily be expected to last over two hundred years. Frame And Filled Doors : The front of a door. A different door showing the inside face. Frame And Filled Doors : Sketch of construction details. A few additional points on the construction of the timber doors. This type of door, should have all it's boards and rails painted with primer before assembly, at the least the parts that can never be painted again. This is a definite factor in making a durable door. Particular attention is paid to the end grain top of the boards. Letting a primer soak in and then repeated dabs of paint before they are fixed. As in the photo below, if the door is large and heavy the hinges are made to suit and sometimes bolted through boards and rails. The nail fixing of the boards is standard, they are not clenched. Only the stiles and the top rail are the full thickness. Any other rails and muntins are thinner, by the thickness of the boards. The thinner rails use barefaced tenons into the styles. Frame And Filled Doors : Probably not the original double doors for this opening, but these look as though they will be there for many years yet. Photo thanks to D.Jeltovsky and Morguefile. Go To Top : Frame and Filled Doors.